O/o Directorate of Sports & Youth Welfare, Assam. 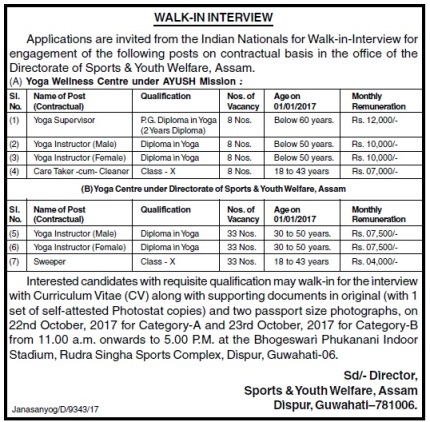 Applications are invited from the Indian Nationals for Walk-in-Interview for engagement of the following posts on contractual basis in the office of the Directorate of Sports & Youth Welfare, Assam. How to apply: Interested candidates with requisite qualification may walk-in for the interview with Curriculum Vitae (CV) along with supporting documents in original (with 1 set of self-attested Photostat copies) and two passport size photographs, on 22nd October, 2017 for Category-A and 23rd October, 2017 for Category-B from 11.00 a.m. onwards to 5.00 P.M. at the Bhogeswari Phukanani Indoor Stadium, Rudra Singha Sports Complex, Dispur, Guwahati-06.